1) When it is dynamic and demanding, art does not wait to be accommodated and validated by the lexicon of the status quo: stimulating art is constantly requiring (of us) new lexicons and redescriptions. Art is catalytic and accrescent: it changes the shape and extends the reach of language. As we work to contend with the mutations of art forms and with the worlds unconcealed by those forms, new linguistic modes are discovered out of necessity and respect. 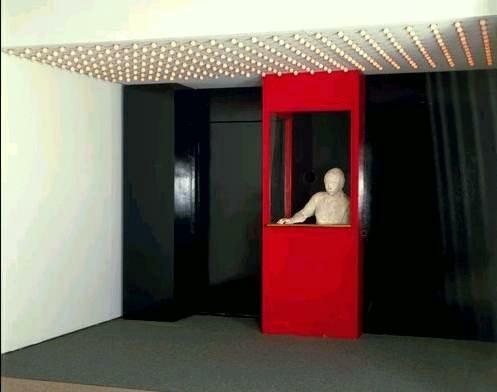 George Segal, ‘The Moviehouse’, 1966-67. 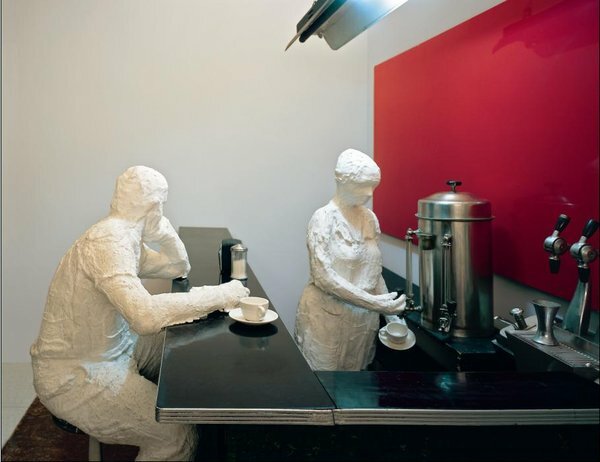 2) Call up the dynamic and demanding sculptures of American artist George Segal (1924-2000). In very many of his works we are confronted with the pathetic tension between the human being and the man-made environments which throw that being into relief. With more force than Hopper, in real space and with silent interaction, we meet the human condition seen in all-American sharpness: the moviehouse, the diner, the transportation station, those environments of – is it? – advancing capitalism; environments which make more plaintive the recognition of alienation. I read an article in Life magazine describing the DNA molecule. It seems you have to cut through a slimy, visceral mess, the kind that delighted Soutine, to get to a small bloody fragment that you put under an electron microscope. Amazingly a pure geometric helix is revealed. The ooze is undeniable – so is the geometry. Weaving together aspects organic and geometric keeps occurring to me because I suspect a natural truth that contains many seeming contradictions. 4) Segal bandaged his sitters with that hospital plaster used to mend broken bones. A sloppy, wet and hot process of covering and setting, the ooze is undeniable. The final form is formed by the disappearing of the specificity of the sitter as internal mass as the plaster casts dry and become Segal’s disembodied, super-present stand-ins. 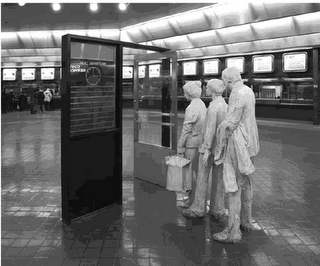 5) Disembodied units stand at once for the forlorn Human and the living persistence of the imagination realised. But this is no longer a contradiction: Segal’s artwork unconceals not a simultaneity of two seemingly discrete components, but the wholeness of whatever is the larger sum. 6) n segality (si-gal’i-ti) the quality that emerges in an artwork which painfully and poetically registers all at once its force and futility as an antidote to the oftentimes forlornness of contemporary, mediated life.